I'm excited for the opportunity to share a new to me brand with you, Twisting Nether. She has a bangin Black Friday sale, a new collection (shown below) and many more polishes for us! If you like what you see, head over to her shop for the Black Friday sale and try a few! I enjoyed the formulas for all of these, smooth, fluid, almost buttery-like. No streaks, no clumps, no goo - just smooth easy application. The bottles are equipped with squared-off flat brushes which allow great control over where the polish lands on the nail (less clean up, yay!). 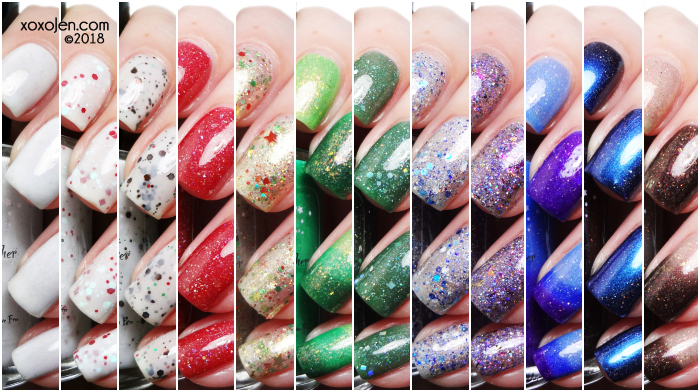 Kasi has made twelve different polishes for us, from toppers to crellies, even a vampy multichrome! There is something for everyone in this holiday collection releasing on Black Friday. 2 coats shown, very smooth application, no streaks. For complete vnl coverage, 3 coats recommended. 2 coats shown, very smooth application, needs a little more care than the crellies for application but overall not streaky and easy to apply. 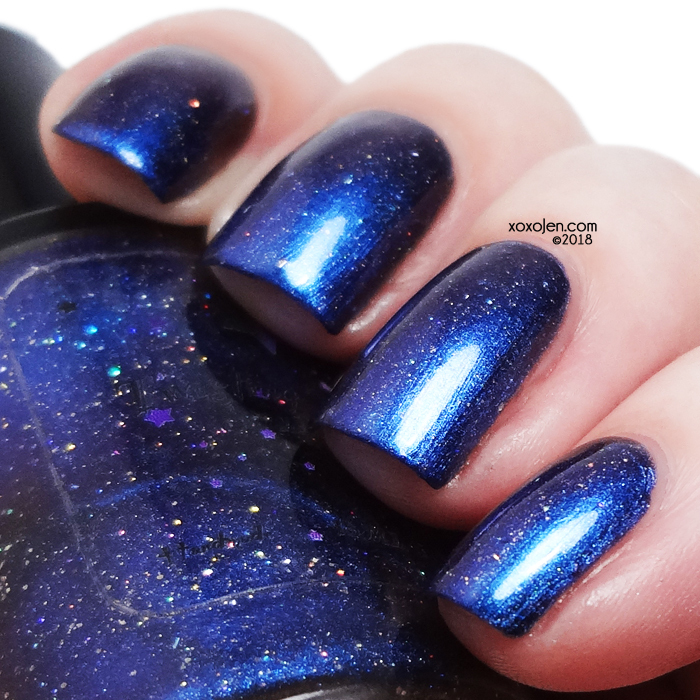 Holo base with light and dark blue holo glitter mix and white matte glitter in different sizes. 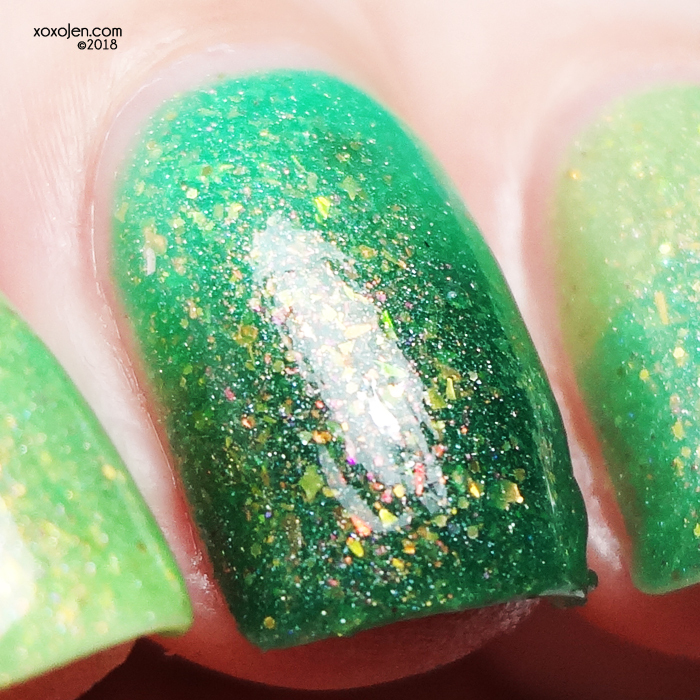 2 coats shown, I like the look of it this way but you could also sponge it on for an even more dense look. Also works well as a topper. Gold and silver shimmer base with gold, red and green holo glitters and mini red and gold holo stars. 2 coats shown with topcoat. 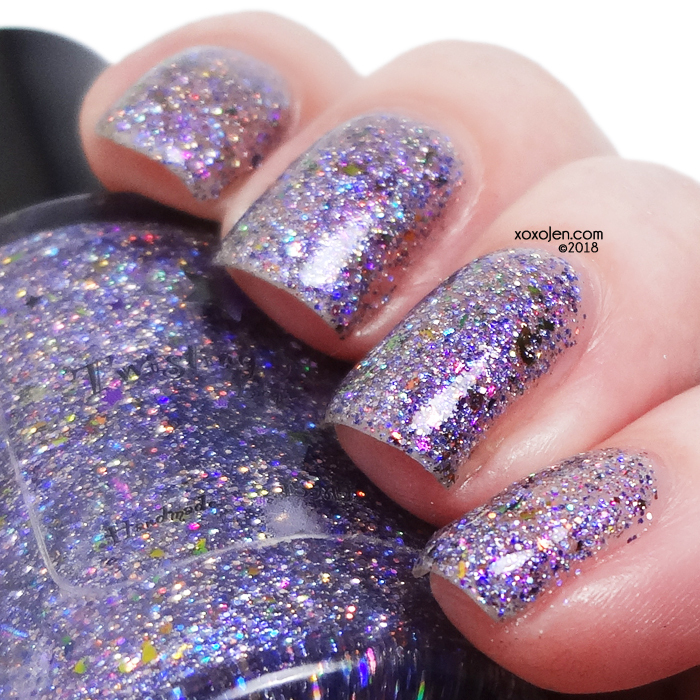 Such a pretty glitter bomb! Loving it this way, but also works well as a topper. Trithermal: Dark green when cold to medium green to light green when warm. Filled with holo, gold galaxy holo glitters, red/gold aurora shimmer, copper-red-green-gold and copper-green-gold chameleon flakies. 2 coats shown with topcoat. This is my first trithermal and it was so much fun to watch it shift and change as I dunked it in ice water. My hands are almost always hot, so I was concerned that I wouldn't be able to capture all three shades, but the change was gradual enough that I was able to see all of them for good amount of time. What a fun polish! Trithermal: Purple when cold to sky blue to light blue filled with p urple-blue-indigo crystal chameleon flakies, holo flakes, silver galaxy holo glitters, holo and aqua and purple sparks. 2 coats shown with topcoat. This is my first trithermal and it was so much fun to watch it shift and change as I dunked it in ice water. The three colors of this one lasted for a good amount of time just like the green one, so it was fairly easy to shoot. What a fun polish! Thermal: Black when cold to clear when warm. 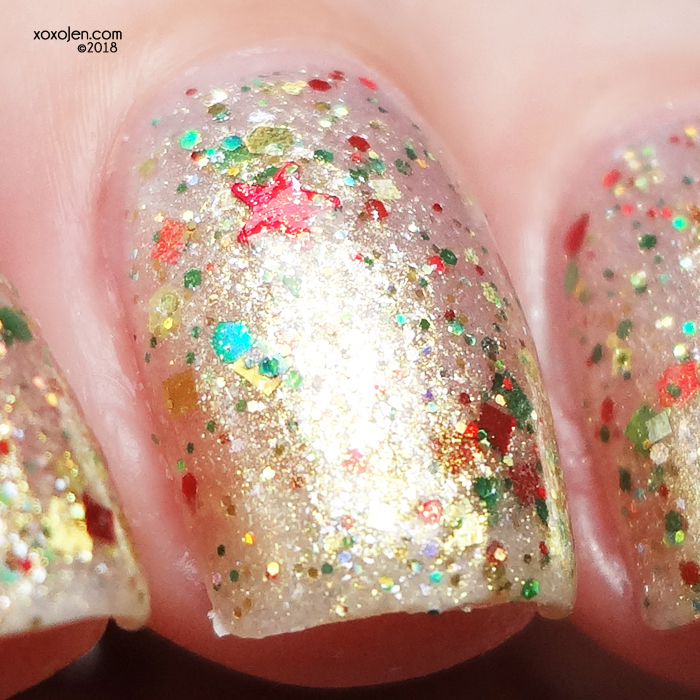 Filled with holo, red/gold aurora shimmer, gold flakes, gold galaxy holo glitters. Green base with holo pigment, holo flake, silver holo glitter blend, and silver galaxy holo glitter. 2 coats shown and I quite like the finished look here, for a more opaque look add another coat. Red base with holo pigment, holo flake, silver holo glitter blend, and silver galaxy holo glitter. 2 coats shown with topcoat, sister to the above polish. The two would look great together with some nail art! The North Pole Of Course! 2 coats shown, formula was great. I find the shift more apparent as I switch between different sources of light from bright to dim. Nailart! I stamped snowflakes from MR-01 with Joss Blue Shimmer over Freshly Fallen Snow then topped with Frosty for a beautiful wintery manicure. I've shown it both glossy and matte because I couldn't decide which way I liked it more. Which is your favorite? I hope you have enjoyed my review and photos of this brand's polishes. Join me in the Twisting Nether facebook group where you can meet Kasi and see many of her beautiful polishes. Be sure to visit the Twisting Nether shop for this set and other great deals for black friday! She is discounting the polishes by $1 per bottle and there will be a large variety of others for only $5! She has even set up a special discount with Indie Brand Collective for free shipping and free polish with purchase by using code IBCBF2018. That nail art matte is so cool! Beautiful nail art! It makes your nails look like perfect press-ons, rather than homemade works of art. I think the glossy topped version has that extra sharpness with ever so slightly bolder snowflakes and crisp lines.